Liss Wools stocks a variety of gifts perfect for treating a loved one, or treating yourself! 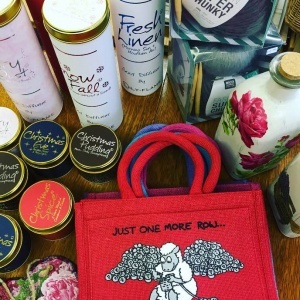 Some of our most popular items include fragrant reed diffusers, scented candles, stylish tote bags and a range of knitting accessories. We also stock a selection of seasonal gifts throughout the year, including festive Christmas candles and beautiful Easter ribbons. Visit our store in Liss to browse our latest gift selection.